Tomy offered the prize in this summer. 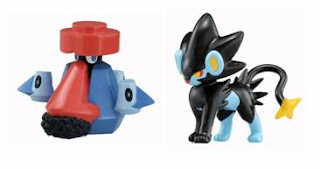 It is Pokemon Darkrai figure, the head part is Glow-in-the-Dark version. Size and pose are same as Tomy MC already released one. Pokemon New game 'Mystery Dungeon 2 Time and Darkness Exploration Team', working on Nintendo DS lite was released at 13 Sep 2007. 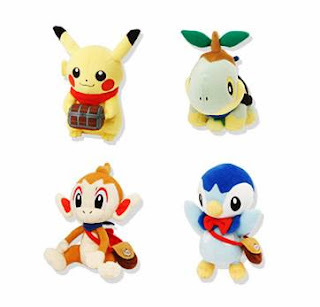 New Pokemon plush, Pikachu, Turtwig, Chimchar and Piplup as well. 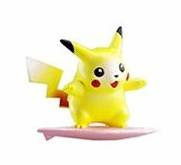 After running AAPF, surfing Pikachu figure is the most frequently inquiry. Tomy was released it in 2000, Bandai Pokemon Kids was in 2003. PokeKids had 3 color of surfing boards, pink blue and white. 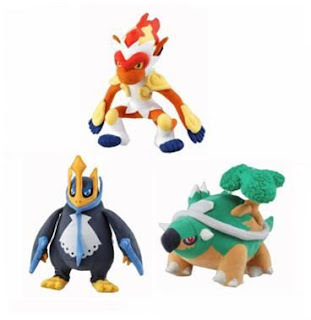 Tomy will release 3 new Pokemon plushes, static pose at 19 October. As for dynamic pose figure, will be released in November. For Pokemon figures collecting, we can get them with 4 major series at present. 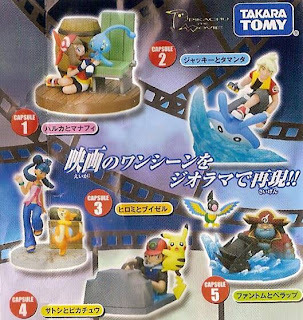 In August 2006, Yujin released the figures of main cast in Pokemon movie 9, Pokémon Ranger and the Temple of the Sea. 5 kinds, capsule toys, dynamic pose, assemble type. May, Jackie and Lizabeth's neck are movable, moreover May's head, arm and leg as well. The figures was going to sell at ordinary toys store, however by some reason, was sold at seven-eleven stores only. 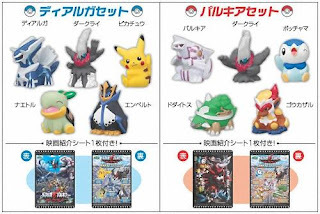 New Pokemon plush, Shieldon, Glameow, Bonsly, Electivire, Palkia and Cranidos, Stunky, Mime Jr., Magmortar, Dialga will be introduced by Banpresto in the end of October. Size is approx. 5.5-6" height. It is a game prize. Palkia and Dialga is same plushes in last November. If interesting, please check the following PowerAnime's links. 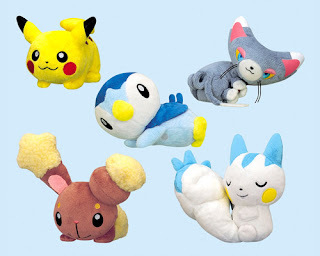 New Pokemon plush, Piplup, Pachirisu, Buneary, Glameow and Pikachu will be introduced by Banpresto in the end of September. Size is approx. 5.5-6" height, relax posing. It is a game prize. 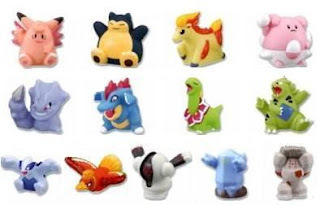 The following posts are Pokemon Figures release info of major series in September 2007. Yujin 3D Pokedex Series (Zukana) DP06, will release 17 figures/７sets in December January 2008. Updated summary list of released figure, refer to Pokemon DP figure release summary. Bandai Pokemon Kids DP5, a photos (21 October release figures) is uploaded. Bandai released 11 figures of Pokemon Clipping series in April. Size is 1.9"-2.7", it's a candy toys, pose is natual and clipping from actual scene. Second series will be released in November. 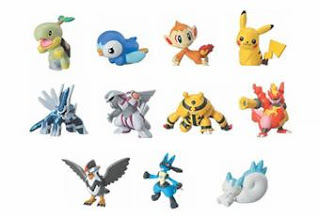 Bandai Pokemon Super Get Series 12, will release 10 figures of Pokemon DP in December. Will post the photo later. Updated summary list of released figure, refer to Pokemon DP figure release summary. 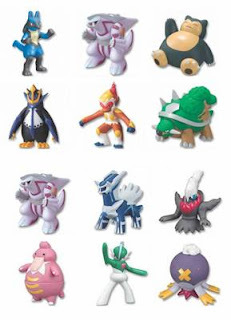 Bandai released 11 figures of Pokemon Kids Deluxe Diamond Pearl series. First 6 figures in the photo were released in February, next 6 one were August 2007. Named Pokemon Kids DX. Same as Poekmon kids candy toys. Size is 2.5"-3.5". Dialga is same figure. Tomy will release 3 figures in Battle Scene series, dynamic pose at 18 November. Dialga, Palkia and Darkrai in this series were released in July. As for plushes, it will be released in October. 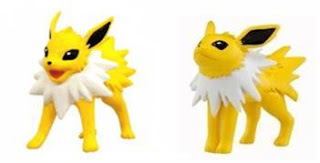 Tomy will renew 2 Pokemon figures, Vaporeon and Jolteon at 18-November. A right figure in the following photo is current one, a left is renewal. As for other renewal, please refer to Meowth and Flareon. Venusaur, Charizard and Blastoise will be in December. Tomy Monster Collection Series will release 2 figures of Pokemon DP at 18-November. Updated summary list of released figure, refer to Pokemon DP figure release summary. Bandai Pokemon Super Get Series 9 and Yujin 3D Pokedex Series DP05, photos for September release figures are uploaded. In one of major Pokemon fun site in Japan, they set the quiz (50 questions) about Bandai Pokemon Kids figure, with correct answer by 3rd September and lottery, then gives the prize 3 Pokemon Kids figures. They are new color version (Shiny Pokemon) of 10th Anniversary Box set. Bandai started Pokemon Kids series since 1996. This box set was 10th anniversary special sales at 5th December 2006. Figures check sheet and Game play (Sugoroku) sheet are attached (1sheet). 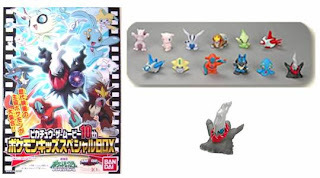 Bandai Pokemon Kids series, released 2 box sets at 24th July, for 10th movie Palkia VS Dialga VS Darkrai. Named Pokem-Kids movies, Dialga set and Palkia set. We can see the legs of Darkrai in Dialga set ! As for Pikachu, Turtwig and Piplup are new pose compare with 10th Anniversary Box set. Updated summary list of released figure, refer to Pokemon DP figure release summary. A new Pokemon movie was released in July 2007, Dialga VS Palkia VS Darkrai. Bandai then introduced 12 pcs figures box set, named 'Pikachu the movie 10th Pokemon Kids special box'. All of figures are Legendary Pokemon. This box set was limited, available at stores of Seven-Eleven and Ito-Yokodo, not ordinary toys stores. Attachment sheet in the box is Pokemon-kids figure check list and introduction of Pokemon's movie for 10 years. A clear version of Darkrai figure is included. As for Entei, it is new pose. Latias and Latios are attack version, 'wish' and 'Dragon Claw'. 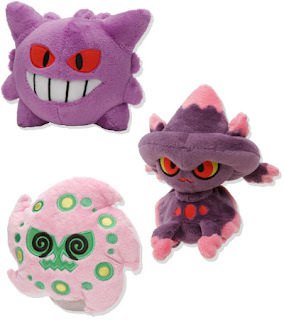 Plushes of Gengar, Mismagius and Spiritomb were introduced by Pokemon Center at 1st September 2007, named "Halloween-set". Size is approx. 5.5" height. 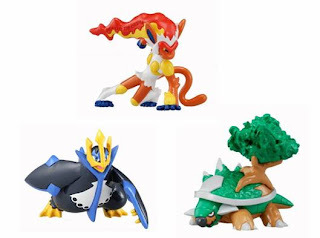 Bandai Pokemon Kids series 'Attacks learned' 07, will release 13 figures 18th September. 'Attacks learned' is Pokemon Diamond Pearl version.